Free agency isn’t all about the big spending and the marquee names. Often some of the biggest impacts on following seasons come from lower profile players that land in the right situation with the right opportunities to display what they can do. Here are five underrated signings that could have big impacts in 2018 alongside those we expect from the bigger name signings. The Miami Dolphins were able to bring back defensive end William Hayes, a player they traded for but saw just 271 snaps of action last year before injury shut him down. Hayes has been perennially underrated as a player, and actually posted a career-high in overall PFF grade (85.6) with the Dolphins. Hayes now has five seasons with an overall PFF grade above 80.0 and two more that fall just short of that mark. He only had one sack in 2017, but he had 15 total pressures, a batted pass and 17 defensive stops over those 271 snaps, grading well against both the run and the pass. With Miami’s roster looking pretty hit or miss, Hayes could be an important player for them in 2018 if he stays healthy. The New York Jets missed out on their prized target at quarterback – Kirk Cousins – and were left looking for backup options, with the understanding that they will likely look to address the position once and for all in the upcoming draft. 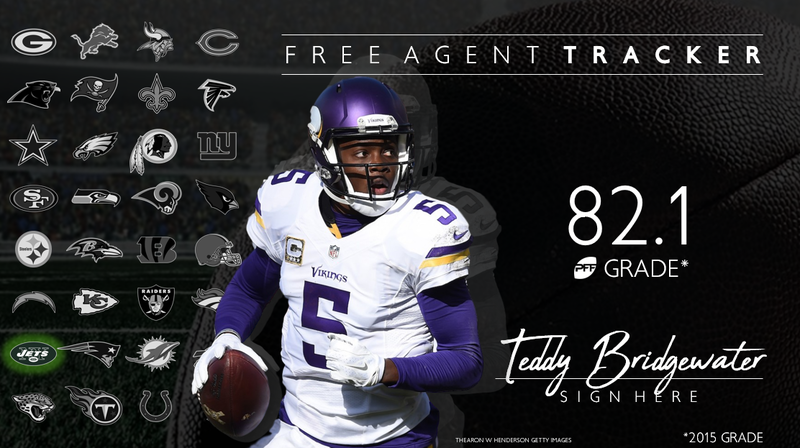 Teddy Bridgewater represents a quarterback with massive question marks, but legitimate franchise quarterback upside, and has been signed to a cheap enough deal for the Jets to take a gamble and see if it pays off big. Bridgewater is just 25 years old and had two seasons with a PFF grade above 80.0 before a devastating, freak knee injury threatened to end his career. He was also trapped in a Vikings scheme at the time that did not suit his skill set and actually influenced him into playing with a conservative, checkdown streak. Between injury and the unknown of what he will do in another scheme, there is much uncertainty about Bridgewater’s play going forward, but there is also huge potential to the move. Chris Baker looked like a good fit in Tampa Bay when he signed, but it never worked out that way, and last season was a notable decline in performance from his time in Washington. He had 11 fewer stops than he had in his final season with the Redskins, and 21 fewer than the year before that. His lone sack actually does a good job of illustrating how little he brought as a pass rusher, with only 14 total pressures on the season, 28 fewer than the season before. Baker though had two seasons of quality play before last year and is a good candidate to rediscover his better play after a jolt to the system. He joins a solid defensive line on the Cincinnati Bengals and could prove to be a much better player there than he was for the Bucs. Starting tackles are hard to come by and the Cleveland Browns are now in need of two of them with future Hall of Famer Joe Thomas officially retiring. Chris Hubbard stepped in to start 11 games for the Steelers due to injury last season and while his season was up and down, the signs were there that he could do the job, and now certainly provide an upgrade over Shon Coleman at right tackle for the team. Hubbard allowed just three sacks all season and though his overall PFF grade was just 69.6, good enough only for 40th in the league, that grade was badly dragged down by one disastrous game against Baltimore (32.4 PFF game grade), and his pass protection outside of that game was actually very solid. Starting caliber cornerbacks don’t grow on trees in the NFL and there is significant value to a player that has demonstrated he can hold up in that role. The last time Tramaine Brock saw starter’s snaps, he ended the season with an overall PFF grade of 81.7 before languishing as a depth player on the Vikings’ bench in 2017. Back in that 2016 season, he allowed just 50 percent of passes thrown his way to be caught, and though he had only one interception, he had nine pass breakups. The Denver Broncos just said goodbye to Aqib Talib, and while Brock won’t replace that level of play, he could become a valuable third corner for them, allowing Chris Harris Jr. and Bradley Roby ahead of him on the depth chart to have some capable reinforcement.